Biryani lovers of Delhi, unite! NDTV Food conducted The Big Biryani Review on 26th July 2017. The first-of-its kind review featured about 16 biryani delivery outlets spread across Delhi-NCR. The participants too left no stone unturned to put their best food forward in their attempt to be named as Delhi-NCR’s best biryani delivery outlet. Our team tasted all the samples in four batches. Since it was a blind tasting review, none of them knew the name or the brand of the biryani they tasted. Each sample was number tagged and laid out with their set accompaniments on the tasting table. People marked their ratings from one to five for each biryani on a common evaluation sheet that was handed out to everybody present in the tasting room. The biryanis were judged on parameters of: taste, accompaniments, flavour of rice, taste and quality of meat and veggies. As a part of the review, the biryani outlets were asked to deliver two samples of their biryanis (one vegetarian and one non-vegetarian)to our Delhi office, along with their standard accompaniments, if any. 1. Rice and Spice: All biryani and pulavs that are offered by the delivery kitchen are made fresh on order with the best quality rice and the freshest meat. It serves 200gms of meat and 300gms of rice in a total of 500gms of biryani. Among its many varieties of biryanis – hyderabadi chicken biryani with burrani raita and mirch ka salan is the most famous. They also have vegetarian options in the form of pulav like paneer makhani pulav, which is a hit amongst their vegetarian customers. They operate out of their two outlets – Malviya Nagar and Hauz Khas, and deliver to around a radius of 5 kilometres. They not only take bulk orders but also serve north Indian meals as tiffins to a few corporate offices and individuals on a daily basis. 2. Teekhi Biryani: They offer three major varieties of biryani – chicken, egg and vegetarian biryani. Both its chicken and vegetable/vegetarian biryani are very popular because of their taste and convenient packing, which makes it very easy to serve and eat. One portion of chicken biryani consists of three succulent pieces of chicken. Located at Noida Express Highway, near Amity University. Teekhi biryani is a popular choice among college students and all the offices located in the vicinity. They mainly deal with biryanis and are open to bulk ordering or catering for events. 3. Sassy Begum: They specialises in Hyderabadi cuisine with three major variety – vegetable, chicken and mutton biryani. All their biryanis are cooked on dum, which makes them even tastier and authentic Hyderabadi kachhe gosht biryanis. Apart from this, they offer a number of other delicacies like shikampur kebab, bagarey baingan, tamatar ka kut, dum ka murgh among many other Hyderabadi sides. They deliver all around south Delhi and are open to bulk orders. 4. Oh My Biryani: This outlet offers nine variants of their signature biryani – four varieties of vegetarian, one variety of egg, and four varieties of non-veg. They serve one-fourth meat or veggies with three-forth portion of biryani rice. They have declared their ratio to be the highest offered by any biryani chain in Delhi at such low prices. Their most popular variety of biryani is classic chicken dum among the non-vegetarian variety and subz biryani of vegetarian variety. They are known for tweaking the taste of their biryani to suit the north Indian palate. Their flavour is developed in-house and they make use of special masalas that are unique to their preparation. Additionally, they guarantee an authentic cooked biryani by slowly-cooking it for two hours in traditional dum style and then sealing the mix with atta in a handi. Apart from biryani, they also offer authentic Mughlai and north Indian curries, tandoori starters and a large spread of Indian breads. Open to delivery in all around Noida, Indirapuram, Vaishali and Vasundhara, they also cater large pre-packed party orders for up to 150 people. 5. 19 Flavours Biryani: 19 Flavours Biryani is known for adding a new biryani flavour on 19th of every month. 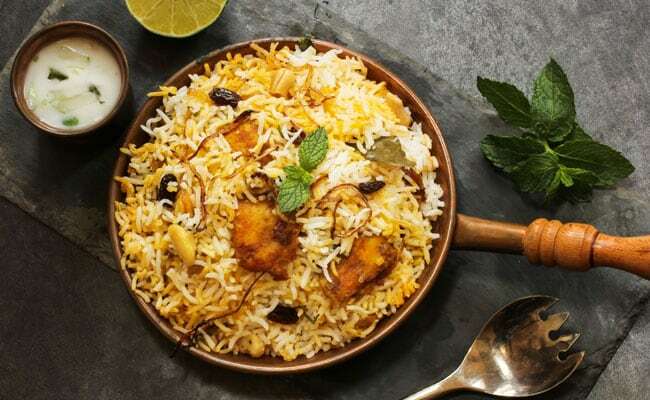 Currently, they have 11 variants, but their target is to attain 19 types of biryani in coming months, ranging from Hyderabadi style to Lucknowi style biryani. For every one kilogram of biryani portion, they serve 300 grams of meat and 700 grams of rice. The signature biryani at 19 Flavours Biryani is udham chicken (Hyderabadi style) for non-vegetarians and kathal biryani for vegetarians. 6. Biryani Next Door: Biryani Next Door offers around 10 different varieties of biryani with chicken and mutton dum being its most popular. They are known for serving a large portion of meat with rice. Their meat to rice ratio is 4:1. They offer half kilogram of biryani in each serving at very affordable prices, which makes it appealing to everyone. They deliver all around Noida, and are open for bulk ordering and catering. 7. Biryani by Kilo: Biryani by Kilo dishes up whopping 17 variants of biryani, which they offer across three different categories – Hyderabadi style, Lucknowi style and Kolkata style. Their newest addition to their menu is malamaal biryani with 50% meat and rice ratio. Hyderabadi chicken biryani, mutton keema biryani, kathal biryani and mutton boneless biryani are some of their most popular varieties. They also serve delicious range of kebabs, korma and desserts. Delivering across Gurgaon, Delhi, Noida and Indirapuram, they are also open to bulk orders. 8.Malabar House Biryani: Malabar House Biryani offers three major variety – thalassery chicken, mutton and vegetarian with a standard portion of about 550 grams including three pieces of chicken. Their most popular variety is the thalassery chicken biryani. They are famously known for making a preservative-free biryani with spices that are freshly grounded. They also guarantee the use of ‘pure ghee’ along with its fresh and superior quality ingredients. They also serve many other delicacies apart from biryani too, from chicken stew, Malabar parantha to Kerala style chicken fry. They are also open for bulk ordering and catering. 9. Petu Ki Biryani: Located in Indirapuram, Petu ki Biryani is both a take-away and dine-in biryani joint, offering many varieties of biryani. They ensure that a minimum proportion of 1:3 (meat to rice) is always maintained in their biryani. The rice, herbs, spices and meat/chicken portions are mixed and layered in a handi and then cooked in dum style to keep the flavours intact. Despite being a relatively new joint in the food sector, it offers about nine types of biryani. Among all their offerings, the most popular and in-demand biryani is chicken dum biryani in the non-vegetarian variety and shahi veg biryani in the vegetarian variety. Their ‘dum’ cooking method seals in all the flavours to create mouth-watering taste makes their product very appealing. Besides biryanis, they also serve veg and non-veg starters, main course and beverages. With their specialities ranging from nargisi egg, paneer chilli capsicum to mutton korma and keema parantha. They guarantee the fastest delivery for their products while also ensuring there is no compromise in quality. 10. Biryani Binge: Biryani Binge claims to use only the freshest and most premium ingredients to keep the preservatives out. They offer veg, chicken, mutton and keema biryani, which carries a portion that is enough to feed two people at once. All their biryanis are boneless. They deliver within 3 km radius of their outlet, but pre-ordering of biryani is mandatory. No catering services are provided here. 11. Biryani Blues: Biryani Blues offers a plethora of biryani varieties ranging from chicken biryani, mutton biryani to keema and egg biryani with a ratio of 1:2 between its meat and rice in a standard serving. Additionally, it serves vegetarian options as well in the form of paneer and soya biryani and sides like curries, rotis (Malabar paranthas) and chicken kebabs starters. They have outlet all over Delhi and NCR, which allows them to deliver to all places in Delhi, Noida and Gurgaon. Their most popular variety of biryani is ‘the Chicken Biryani’ in which dum is cooked with a full leg piece. It guarantees maximum meat, being cooked in a true “dum method.” They do not perform catering services, but do take bulk orders for festivals and other special events. 12. Rumi’s Kitchen: Rumi’s Kitchen offers four major varieties of biryani – qeemay aur gosht ki biryani, chicken biryani, mutton biryani and a veg biryani. Amongst this, their most popular variant is the qeemay aur gosht ki biryani, in which a regular portion contains about 200 grams of mutton 60 gm of qeema and 240 grams of cooked rice. Their other signature dishes include – hmmmutton pao, which is a pure boneless mutton cooked for eight hours on slow fire with a robust blend of spices. Another would be the gurkha langar chicken curry, which is their tribute to the boys of the Indian Army – in which the chicken is soft but the men are not. Additionally, we are reviving the most favourite erstwhile kabab – the pasanda. They deliver within a 9 km radius of Galleria market in DLF. They do bulk ordering because it allows them to share their labour of love with other people. They also cater for everything from fairs, exhibitions, to office parties and home parties. 13. Ek Dum Mast Biryani: Ek Dum Mast Biryani offers six different types of biryani, and their most popular biryani is Hyderabadi murgi dum biryani. They are known for adding a distinct flavour to their biryanis with juicy meat pieces with very less oil. Apart from their delicious biryani, they serve a variety of both vegetarian and non-vegetarian starters. Some of their most popular deserts are like shahi tukda with rabri in a jar, motichoor rabri parfait and some of the very unique drinks like paan milkshake, mango cardamom lassi and rabri milk. They deliver within the radius of 7-10 km of their outlet in sector-27, Gurgaon and are open for bulk ordering and catering. 14. Biryani Hive: Biryani Hive offers seven types of biryani with a standard portion containing one cup of rice and four pieces of chicken/mutton that is enough to feed two. Amongst these many varieties, the top four choices are chicken biryani, veg biryani, chef chicken and boneless chicken biryani. The rice they use to cook biryani is of basmati variety, which has been aged for two long years. Additionally, they prepare it with very less oil and cooking it in a non-stick ware. They also offer both vegetarian and non-vegetarian starters and kebabs along with sliders like paranthas. They serve kheer and halwa as well. Biryani Hive delivers all around Noida. They are open to bulk ordering but haven’t ventured into the catering business yet. 15. Biryani Break: Biryani Break offers chicken, cheese, egg and soya chaap biryani with a proportion of 500 gm rice with 2-3 pieces of added meat. Their most loved biryani is the chicken biryani, which like all its other items is popular for being offered at very reasonable prices. Their delivery services cover almost the entirety of west Delhi including Rohini, Pitampura, Mangolpuri and Sultanpuri. They are also open to bulk ordering and catering in addition to their regular services. 16. Behrouz Biryani: Being one of the biggest biryani chains in the country, Behrouz serves three portions of biryanis, shahi biryani that serves one, king size biryani that is good enough for two and kilo biryani that is sufficient for a group of four to five people. To save money and make most of the flavourful goodness, they have plenty of biryani combos as well, wherein your favourite biryanis are teamed with some smoky hot kebabs and snacks. The meat pieces (chicken and mutton) that they use in their biryani is boneless, which makes it even more popular with people who hate the fuss of separating bones from the meat. They have a good variety of vegetarian biryanis too, which are equally popular. All their biryanis come with raita and a piece of gulab jamun. They also have on offer about six varieties of kebabs and tikkis. Other popular sides include buttermilk, rose infused gulkand-e-bahar, rich mughlai gravy and mint raita.Behrouz is also open for bulk orders. PREVIOUS POST Previous post: What Do You Need to Know About PMI-PBA vs CBAP?